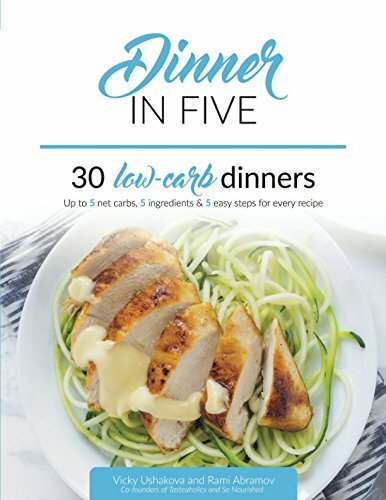 Created by the duo behind the ultra-popular low carb website, Tasteaholics.com, Dinner in Five is a cookbook unlike any other, featuring 30 delicious dinner recipes each requiring only 5 common ingredients and containing up to 5 grams of net carbohydrates. Dinner in Five is the third of the Keto in Five series. Beautiful images for each dinner so you’ll know exactly what you’ll be enjoying. With Dinner in Five, succeeding in your low carb diet has never been easier. Dinner in Five is a month’s worth of simple, delicious, low carb and high fat (ketogenic) dinner recipes that are each made with just 5 common ingredients and are up to 5 grams of net carbs! There’s simply nothing better than that. Being Low Carb is Easier Than Ever! Up to 5 Net Carbs per Serving You can count the carbs in each dinner on one hand! Go ahead, have seconds, you’ll still be within your daily carb limit. 5 Ingredients per Recipe Cutting down the amount of ingredients reduces cost, time, complexity and even the willpower needed to cook. Less is more. Nutritional Information Calculating your daily calories and macros is crucial to hitting your goals sooner. We calculated each recipe so you don’t have to. Personal Support Have a general question about the low carb diet or something specific about one of the keto dinners? Email Vicky and Rami directly any time!